Well it’s simple. You can preset a list of anything, and then it’ll automatically change each day. Or you could just as easily change it up to be blocks of time; weekly or even monthly. 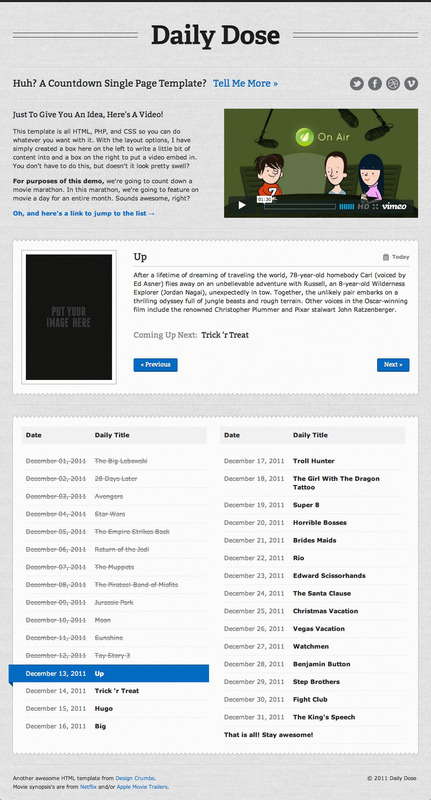 And on top of that, you can list a preview of what’s upcoming on the bottom of the page. Whatever you want! How about a sale a day? A daily to do list? An activity a day? The possibilities are literally endless. The file comes with a set of 3 arrays for each day, title, photo, and description. If you want to add more, it’s as simple as copy and paste. XML lets you set your options including start date, end date, and time zone. Fully automated. Set the configuration options and the content and let’r rip! The list on the bottom automatically fills itself out and balances itself evenly between the columns, no matter how many days you have. After a day has passed, it will be struck out on the list. Messages are displayed if somebody visits prior to your first day or after your last. jQuery enhanced! Built in drawer lets you put more content onto the page than you want to show. After all, if it’s only one page, your users are there for a reason. Plenty of layout options if you need to add more pages or more into the drawer. 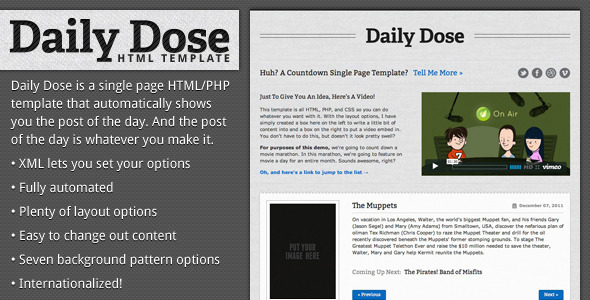 Easy to change out content both in the XML and index.php. There are a lot of files included in this template, but they’re just running things smoothly. You really only need to change content in two (maybe three if you’re adventurous).